February is wahoo month. 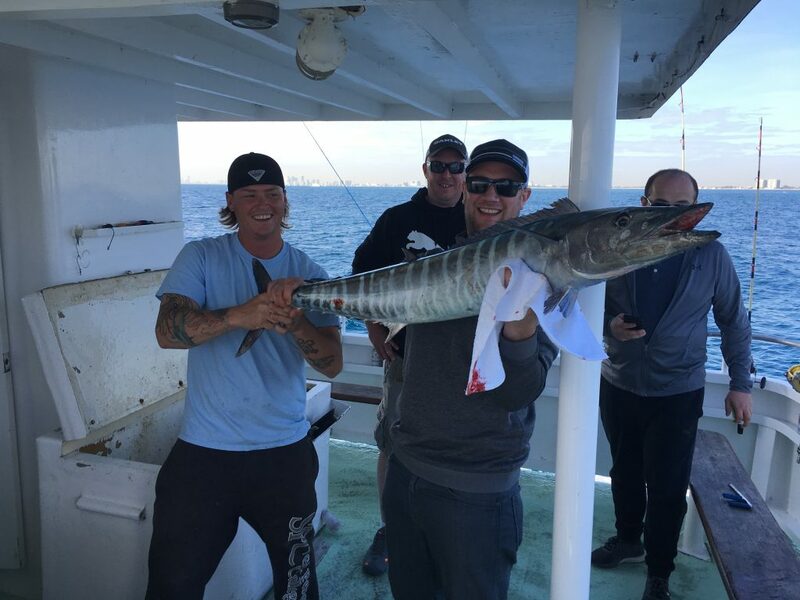 Nice wahoo caught by these guys on a bachelor party fishing trip. Finally! We’re through the rough patch of January where fish are really hard to come by. We’re into February now where the fishing starts to get better and better out here in Fort Lauderdale. The action is improving daily and so are the size of our catches. The fishing starts improving now until it peaks in May. The highlights for February are the sailfish in 100-150ft of water, small blackfin tunas all over the place, wahoo should be biting, the shark migration begins and some of the big game bottom fish start showing up around the wrecks. Nice sailfish by this family on our deep sea fishing charter out of Fort Lauderdale. On our drift fishing trips, snappers are beginning to move back out to the deep, following their retreat last month into the shallow waters. Snappers are the main target on our drift fishing trips. This past month, you really had to work hard to catch some snappers. In the winter months, snappers slide in shallower into 20-30 ft of water. They do their mating spawn and then slowly start moving back out into the deep. The mangrove and yellowtail catches are beginning to improve daily and should be at full strength again by the end of the month. Mutton snappers are biting better and better all the time too. 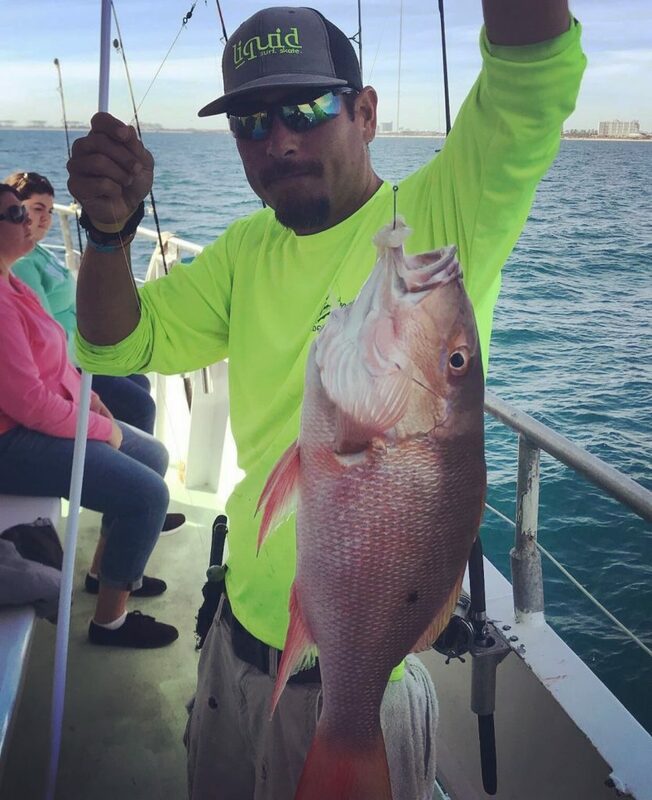 They didn’t slack off as much as the smaller species of snappers did, but mutton had their own issues as this is the first year of the new size limit being 18″. Many of the muttons we caught over the past few months had to be released because they didn’t make the size limit. This is a good thing as it will make for more breeding size muttons in the mix, so many more muttons next year for us. Also, larger muttons are starting to show up already, showing us that this new size limit for them is a great thing. 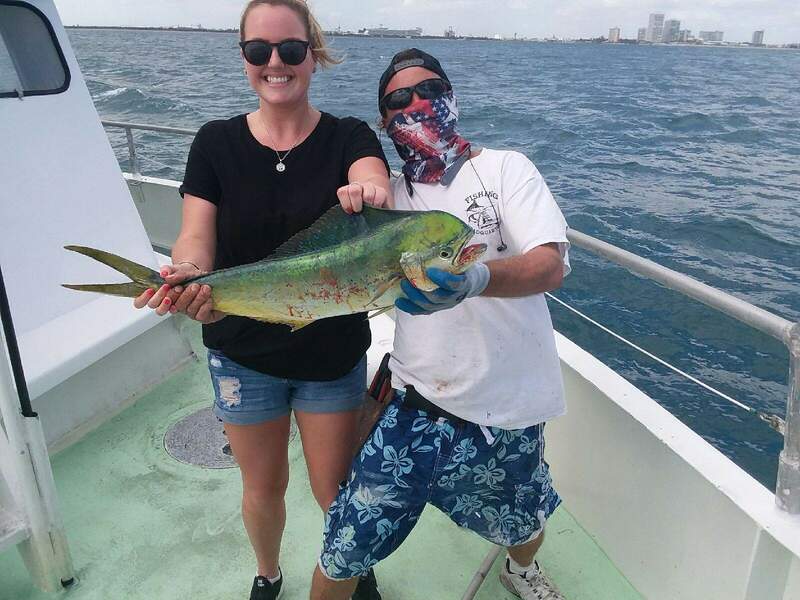 Nice mahi caught by this fisher gal on our drift fishing trip aboard the Catch My Drift. February is prime season for our sportfishing charters. The sailfish, which showed up late again this year just like they did last year, are starting to bite in awesome numbers. Last year was the same thing. They usually show up in November and then start tailing off in early March. This year, they didn’t even show up until mid-January. So, just like last year, the sailfish bite should continue to be awesome all the way through April. 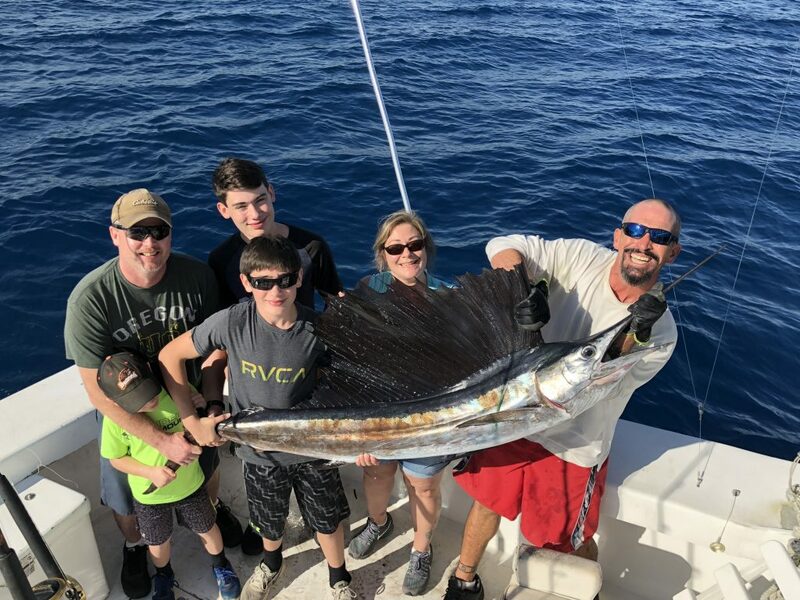 Sailfish are one of our biggest gamefish here in Fort Lauderdale and they are most definitely the most sought after gamefish in the entire world. They are awesome to catch with their aerobatic display of jumping, somersaults and the sheer runs they put on. Everything about sailfish is exciting. 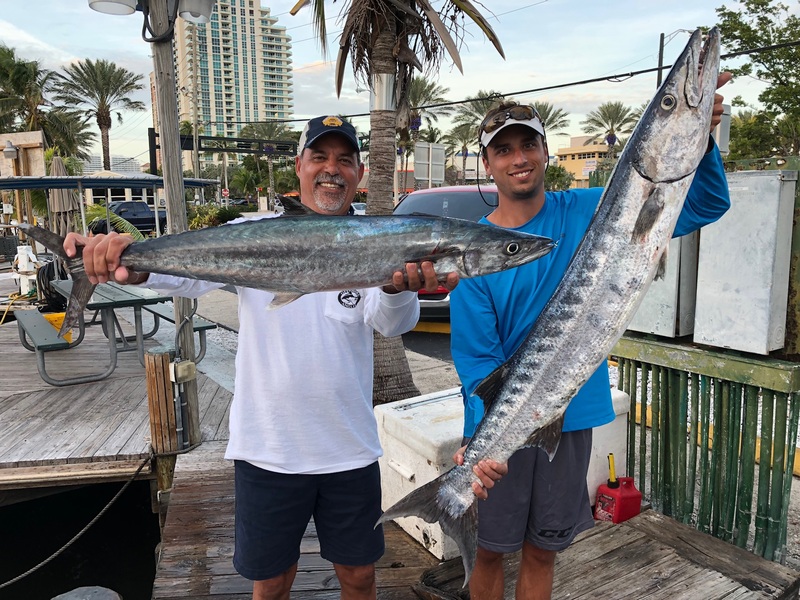 Nice kingfish and huge barracuda caught by this father and son fishing team aboard our sportfishing charter. Sharks are beginning their big migration down our coastline this month. February is the start of the shark train where hundreds of thousands of sharks cruise down our coast on their move northward. We get so many sharks here in Fort Lauderdale, it’s crazy. And they are humongous. We catch hammerhead sharks, tiger sharks, mako, thresher, bull, dusky and more. Some of these sharks are 10 feet long and larger or weigh more than 300 pounds. These are some of the largest and strongest gamefish in the ocean. We run a huge amount of special shark fishing charters, where go out and fish almost solely for big game sharks. These charters are incredibly successful in February, March and April. Tunas, wahoo and mahi are the other species that bite on our sportfishing charters and February is a great month for them. Mahi are sporadic so you never know where they are going to be or when they are going to bite. Blackfin tunas are usually all over the reefs and bite small feathers and other streamline lures that you pull fast behind the boat when trolling. They are usually everywhere on the reefs during February and March and they are very hungry and aggressive. Wahoo are a bit more elusive. You never know where they are going to be or when they are going to bite. They do bite especially well on the tide change, especially the tide change during the full and new moons. The full moon in February is generally a hot to trot wahoo bite on the Fort Lauderdale reefs. 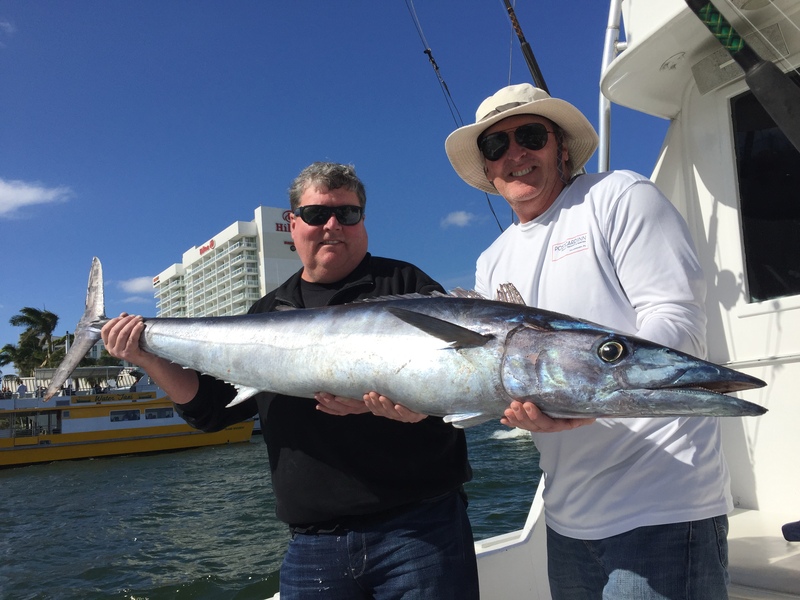 It’s a great time of year for our Fort Lauderdale fishing charters. There’s a lot happening, a lot changing (for the better) and a lot of fish moving through. Good luck to everyone fishing on our charters this month. I’ll sea ya on the water. Nice wahoo caught on our sportfish charter by these lucky guys.